Professional graphic artists create light blue grids to help them lay out their art. You can do the same with your PowerPoint slides. Grids help you see the balance and symmetry of a slide. 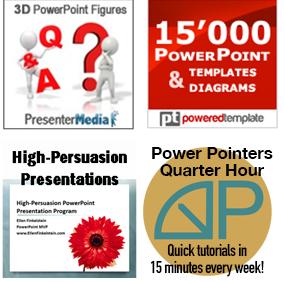 PowerPoint can display guides that you can use to create a grid. To add additional guides, press CTRL and drag the vertical guide to the left or right. PowerPoint displays the distance between the guides as you drag, so you can set them up evenly. Continue with up to eight guides. Do the same with the horizontal guide. For more control, you can create your own grid on the slide master using the Line tool on the Drawing toolbar. Press CTRL-D to duplicate the line. Drag the new line to a new position. Continue until you have a grid. You can also use the Rectangle tool to create a frame around the edge of the slide so that you don’t place text or graphics too close to the edge of the slide. Select all the lines and the rectangle and group them. When you return to your presentation, you will see this grid on all your slides. Use it to help you lay out your slides. When you’re done, simply return to the slide master and delete the grid. Tip on the Tip: Save this grid as a template and use it for all your presentations. You can also display a visible grid. In the Grid and Guides dialog box, check Display grid on screen. You can also set the spacing of the grid. However, if you want a more customized grid, you can still use the procedure listed above. You mention creating a master slide so that you can start off new presentations with guidelines in place. Do you know if there is any way to reset guidelines back to where they where when the file was first created? I have a project where I have inadvertently moved my guidelines. I can’t figure out how to put them back exactly as they were before.